How to use Gladinet, a free online storage management tool, to manage files in the cloud? – We earlier reviewed some of the best free online storage solutions to share and/or back up your files, photos and videos. We also told you about the cloud computing desktop “Gladinet” and its features. Here we tell you on how to use Gladinet to manage your files in the cloud, from your desktop or laptop. Some of the cloud storage solutions that we discussed, do provide their own tools to connect to their cloud from your computer. Gladinet cloud desktop lets you connect to most popular clouds.It is thus a great tool to manage files on the Cloud. If you do own a netbook, then you will be glad to use Gladinet to manage all your cloud storage. 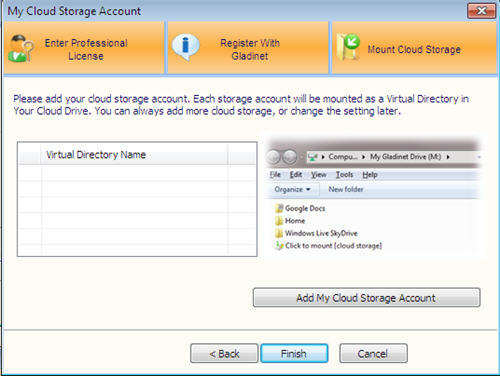 After you download and install Gladinet, launch it to configure your cloud storage. 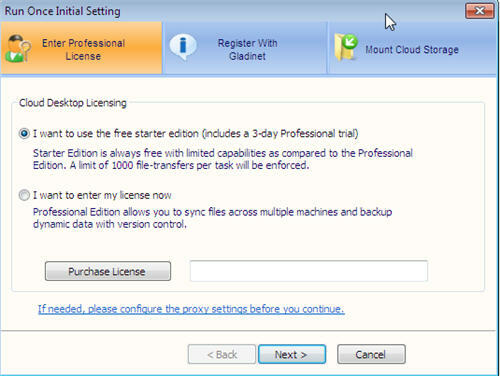 When you start Gladinet for the first time after installing it, it will ask you to enter the license key. If you wish to use the free starter edition, then choose it and click “Next” to register with Gladinet. Registration is free and it lets you receive free updates and technical support! Click “Next” to mount your online storage. You may however choose to add them later through the Gladinet Management Console. If you prefer to add it later, click “Finish” to create a Cloud Drive in the computer. 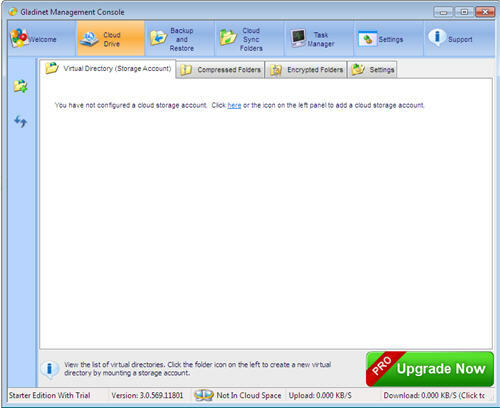 Gladinet creates a virtual disk on the computer. 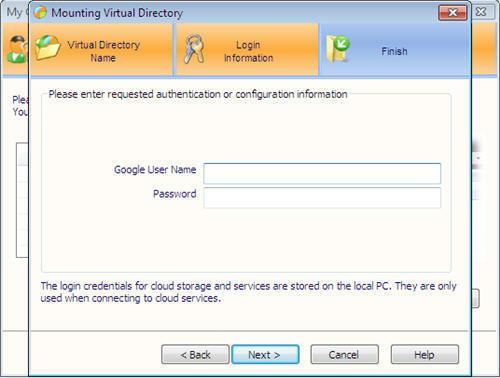 If you choose to add a cloud storage, then click “Add My Cloud storage Account” to mount your online storage as virtual directories in the Cloud Drive of your computer. Then, click Next and enter the login information for that cloud storage (user name and password). These login credentials are stored in your computer and they are only used when connecting to the cloud services. For this tutorial, we set up a virtual directory for “Google docs”. Hence, Gladinet was asking us for the “Google user name” and “Password”. Click Next, enable “cloud sync folder” for the virtual directory and specify the name of the folder to be synced. Finally, click “Finished”! Gladinet will mount the virtual directory in the specified location. 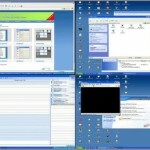 The cloud sync folder lets you to automatically sync files across multiple computers that use the same cloud storage. Files placed in this sync folder are instantly synchronized to other computers that have the same cloud sync folder enabled. 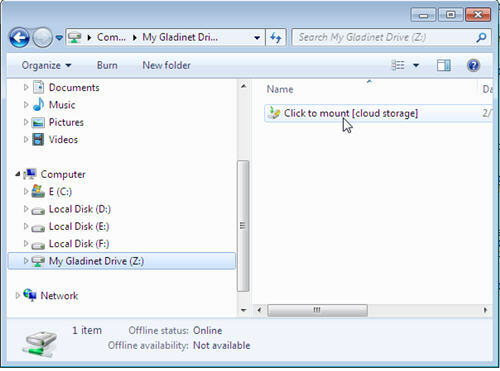 To add a cloud storage account later, double click the “Click-to-Mount links” in My Gladinet Drive or go to Virtual Directory in “Gladinet Management Console”, to mount the cloud storage. 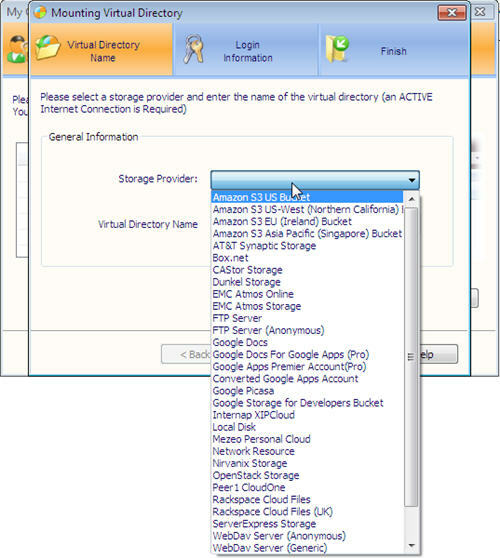 Enjoy managing your online storage space as virtual directories on your computer with Gladinet.